They both have four letters. 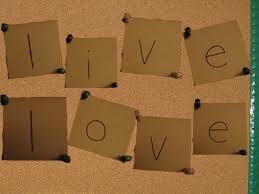 In my opinion, the words Live and Love are alike in more ways than just their spelling. I recently clicked on a short 2 minute video that got me thinking..
Gotta love something that makes you think . right? To really Live is to take risks and chances; to really Love is to take risks and chances. To really Live you must accept what is; to really Love you must accept what is. To really Live is to open your heart to the unknown; to really Love is to open your heart to the unknown. To really Live is to trust beyond your imagination; to really Love is to trust beyond your imagination. To really Live you must see yourself in the world rather than the world in yourself; to really Love you must see yourself in the world rather than the world in yourself. To really Live is to allow wonderful, exciting and mysterious moments fill our lives; to really Love is to allow wonderful, exciting and mysterious moments fill our lives. What if we began to think of these two words as synonymous, interchangeable in our lives? What if Love became how you Live? To Love…, to Live…, what’s the difference? Living isn’t as much about “what” you do as “how” you do it. Loving isn’t about “what” you do; it’s about “how” you do it. I guess there isn’t any difference at all – unless you’re not doing it – either.